If it’s a photo of downtown in the ’40s, with people on the streets, retail storefronts, and streetcars, I’m going to love looking at it. Like this one. A lot of people might be hard-pressed to identify the location of this photograph, even if they were standing in the exact spot the photographer stood in. If you look at today’s view from the same vantage point (here), just about everything in the immediate foreground (west of the Pegasus-topped Magnolia Building) is gone — except for, most notably, the beautiful MKT Building at Commerce and Market, one of my favorite downtown buildings. 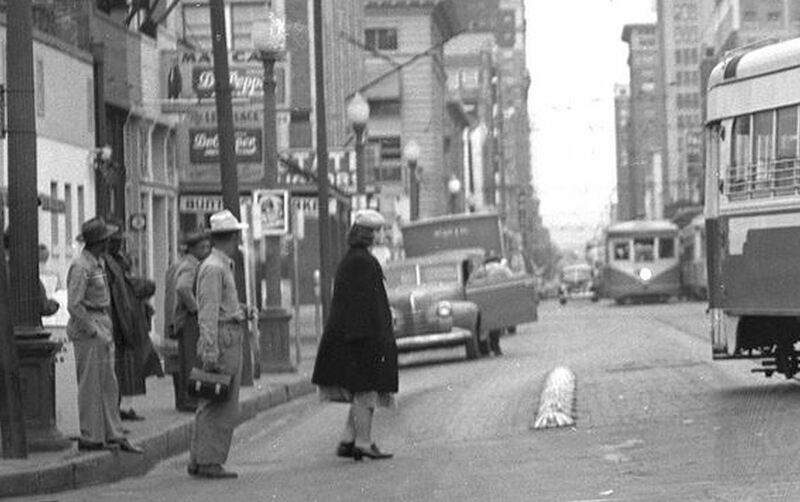 This is the intersection of Commerce and Record streets, when Record still extended from Elm to Jackson; the Old Red Courthouse was behind the photographer, to the left. 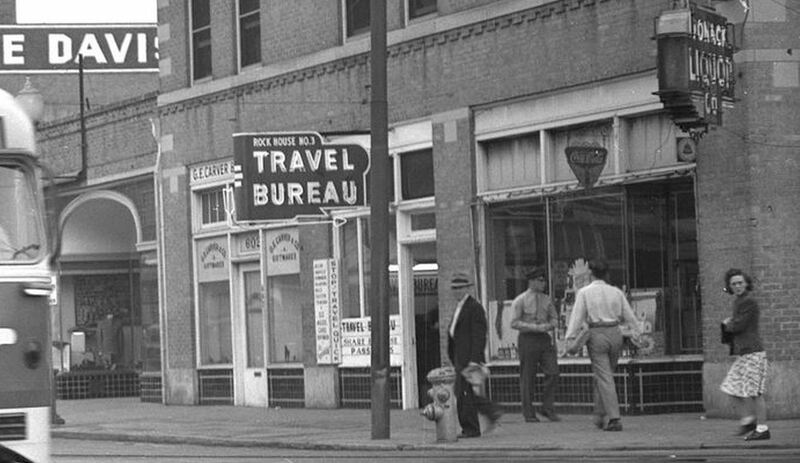 Today, the Kennedy Memorial is at the left where the people are waiting for a streetcar; the George Allen Courts Building is across the street — at the right, in the block with the travel bureau; and the block containing the Willard and Davis Hat building — across Commerce from the Katy Building — is now a parking lot. 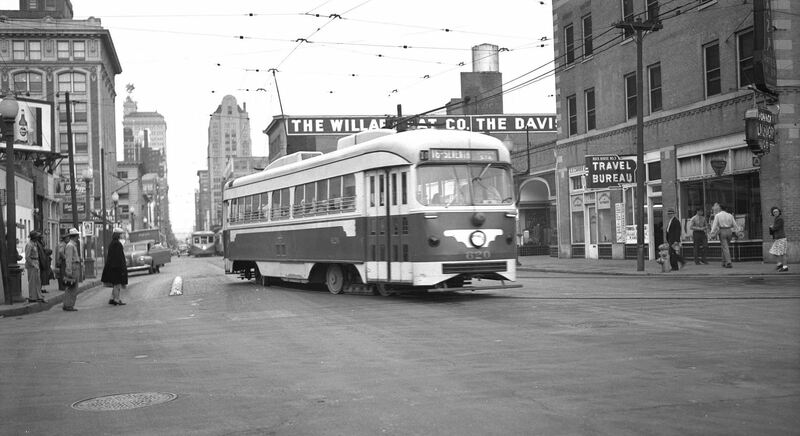 As with every photograph like this I see, I wish I could step into it and walk around the downtown Dallas of 1946. Maybe pop into Ma’s Cafe for a Dr Pepper before I hop on a streetcar and just ride around on it all day until someone kicks me off. Below are a couple of magnified details (both are much larger when clicked). 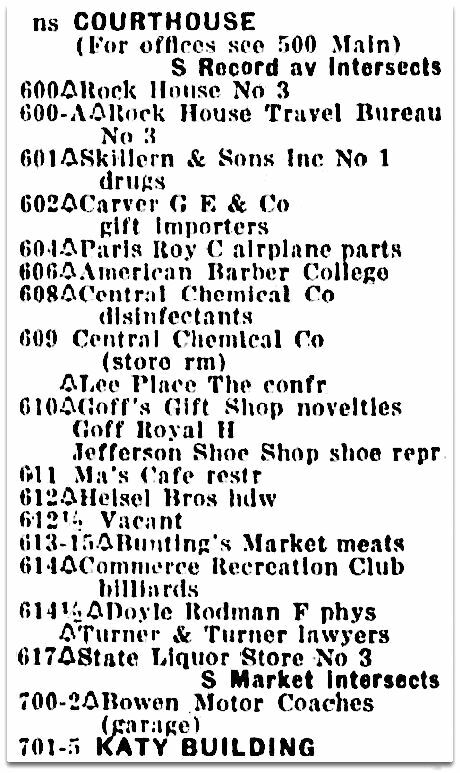 Below is a listing of the businesses in this 600 block of Commerce, between Record Street and the MKT Building. 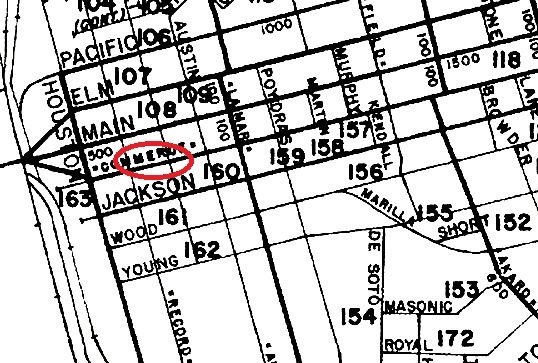 Here’s a detail of a photo taken about the same time, showing an aerial view of Commerce Street. 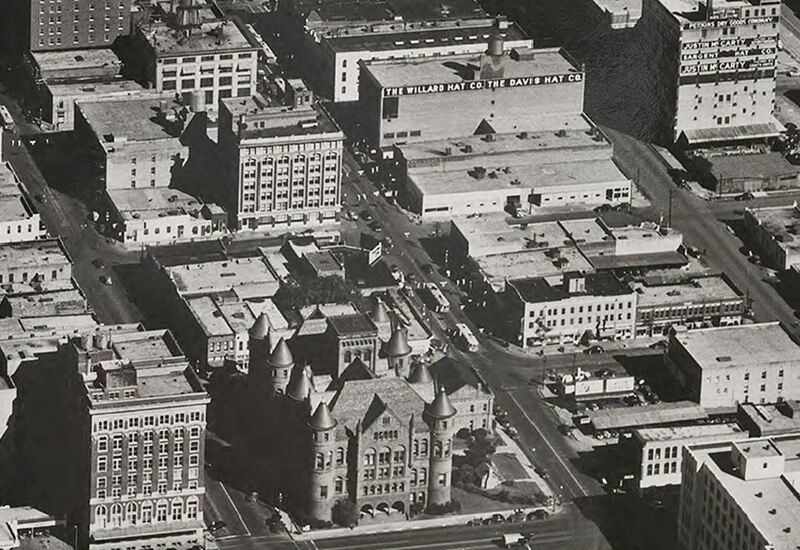 The aerial photo was taken by Lloyd M. Long in the 1940s and is titled “Downtown Dallas looking east (unlabeled); it is from the Edwin J. Foscue Map Library, Central University Libraries, Southern Methodist University. This is only a small portion of the full photograph — the full photo is here. And, lastly, who doesn’t love a map? Everything is bigger when clicked! It’s always the little things that get you–like the working man’s black metal lunchbox carried by the man just off the curb at the left. Yeah, that was one of my favorite details, too. Paula, the Geo. Allen Court Building wasn’t there in the 40’s. Perhaps you were referring to the Criminal Courts Building on Houston & Main? Never mind. I read it to mean Allen Courthouse was there then, but I see now you were talking about what’s there now. Thanks, I wasn’t sure what that building was! This survivor is hidden behind the hat factory in the street photo, but is visible in the aerial view. Hi Paula. I bought a 42 x 33 framed somewhat aerial photgraph today at an estate sale. Looking east from above the triple underpass. Your site here has helped me determine its 40’s rather than 50’s. Thanks for providing so much info. Hey, Patty! (Is this “Shakespeare” Patty?) Glad you found helpful info! It is “Shakespeare ” Patty! From one old book person to another!